The default LibGuides homepage serves as an index of your guides. 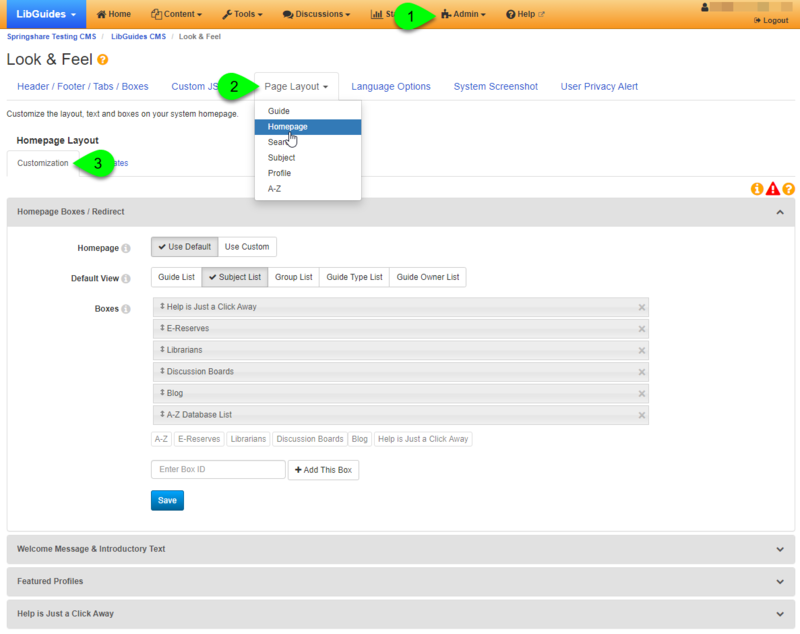 It allows users to browse your guides by title, type, subject, owner, and (if you have CMS) group. There's also a search box so your users can search for relevant pages. However, if you are looking for a more customized landing page for your site, you can actually set a guide as your homepage. This can be especially helpful if you would like to use LibGuides as your library website, since a guide makes it easy to add and manage multiple types of content on your homepage. When a user visits your LibGuides URL, they will be redirected to your homepage guide. So, although they may visit yourlibrary.libguides.com, the browser will be redirected to yourlibrary.libguides.com/guide-url. As a result, you will see the guide's URL in your browser once the homepage loads. Because of this, we recommend that you give your homepage a guide a friendly URL so users will know they're at your homepage. Popular friendly URLs are /home, /homepage, and /library. Due to that redirect, you will no longer be able to access your default system homepage (i.e. the default list of guides). Be sure to provide some way for users to browse or search your other guides via your homepage guide (such a Guide List content item, Guides widget, search box, etc.). If you have LibGuides CMS, consider keeping your subject guides in their own group. Since each group has its own homepage, that group's homepage could use the system default homepage template. You could then link to that group and allow users to browse and search your guides. Library hours: if you subscribe to LibCal, an Hours widget is an easy way to display your current library hours. Just create your widget in LibCal and add the embed code to a Media/Widget asset on your guide. Blog posts: you can use your LibGuides system blog (or, you could even add a blog page directly to your homepage guide) to share news and notes. You can then create a Blog widget to display your most recent posts directly on your homepage. Just create the widget and add its embed code to a Media/Widget asset on your guide. LibAnswers widget: if you subscribe to LibAnswers, you can add a LibAnswers asset to quickly and easily add your LibAnswers widgets to your guide. This is a great way to embed an FAQ search box or question form. Chat widgets: whether you use LibChat or another chat reference system, you can embed your widgets right onto your homepage using Media/Widget assets. Search widgets: if your catalog, discovery service, or other electronic resources provide search widgets, you can also embed these on your guides using Media/Widget assets. Consider using a tabbed box to keep these organized. Gallery box: you could use a gallery box to cycle through new/trial databases, new book releases, LibCal events, or images. Give your guide and each of its pages a friendly URL. That way, the full URL users see in their browser will reflect that they're on your homepage. Give your guide a different title from your system name. Your System Name (from Admin > System Settings) displays right before your guide's name in the breadcrumbs. To prevent having the same name listed twice in a row (which may confuse users), try to give your a guide a different name. For example, if your system name is "Springy Library", you could name your guide "Homepage". That way, the breadcrumbs would show "Springy Library | Homepage". Publish your guide. If your guide is not published, then users will see an error saying the page is unavailable. Once you've created and published your guide, you're ready to set it as your LibGuides homepage. Go to Admin > Look & Feel. Click on the Page Layout tab and select Homepage from the dropdown. Under the Customization tab, in the Homepage Boxes / Redirect panel, set the Homepage option to Use Custom. Set the Redirect URL to the relative URL of your guide. The relative URL of a guide is the part following your domain name. For example, if you gave your guide a friendly URL of "homepage", you would enter /homepage as the redirect URL. If this field is left empty, then your default homepage will still be used. You have a custom homepage. Now what? When a user visits your LibGuides URL, they will be redirected to this guide. As a result, the browser will display the guide's URL once the page loads. 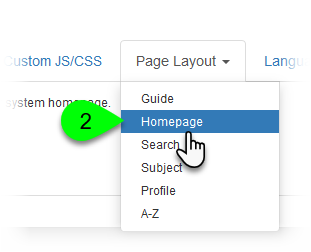 You can revert back to the default homepage at any time by switching the Homepage option back to Use Default. This will not unpublish your guide, but users will no longer see it when visiting your LibGuides URL.